If you are looking for a gift idea for a youth that loves pretend play with animals, check out the pick of the month sale over at Playmobil. 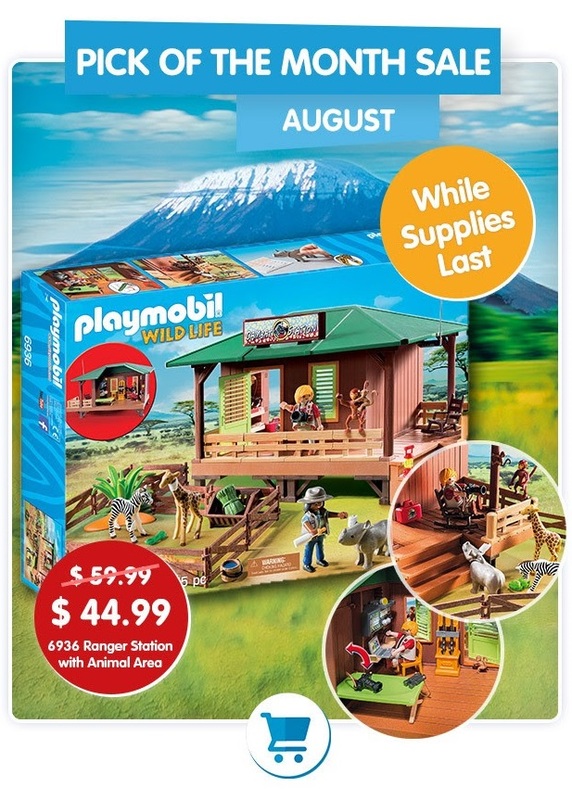 The featured pick is this Ranger Station, which is normally $59.99, but through the month of August or while supplies last, you will save $15 AND get free shipping. Ranger Station with Animal Area features a wild outpost with all of the equipment needed to nurse native animals back to health, including bandages that can be wrapped around wounds, a fenced-in recovery area, folding cot for ranger to stay close even when sleeping, bottles for feeding, and more. Set includes two figures, baby zebra, rhino, and giraffe, mom and baby spider monkey, medical supplies, camera, walkie talkie, binoculars, feeding trough, fencing, and other accessories. Recommended for ages four to ten. Dimensions: 13.6x9.8x8.3 inches (LxWxH).Warning. Choking Hazard. Small parts. Not for children under 3 years.